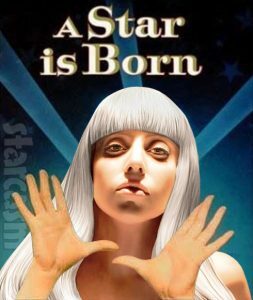 The narrative behind the film “A Star Is Born” is one that Hollywood cathartically likes to tell every few decades. On-screen we see changes that reflect the times we are in, but overall the story remains the same: The male protagonist elevates the career of his struggling romantic interest. Her rise to fame eclipses his star wattage, ergo, exacerbating his already bleak downward spiral. A cautionary tale about fame with a twist of love on the rocks makes for a trope the movie industry keeps coming back to. I’ve seen all versions of the story. The music is what I enjoyed, although in the 1937 version it’s two actors and music background. The 1954 has actor and singer and Judy Garland’s 2nd favorite song, “The Man That Got Away.” It is her other signature song besides “Over the Rainbow.” But what became most apparent watching the current version, is how relative it still is, and people hungrier for fame than ever before. In all four films, it’s a battle of patriarchal ego and the woman who tries to save him from his own vices. 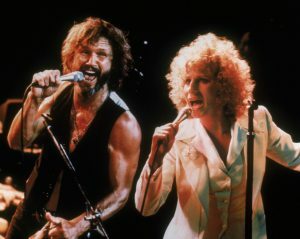 The Streisand/Kristopherson 1976 film was during my era and the big concert rock vibe. Lots of collaborators, including researchers who toured with big bands of the times, like Led Zeppelin and Jethro Tull, worked on the script. Streisand was born for this role and won an Oscar with the song “Evergreen,” with Paul Williams. Many other big name singer/songwriters, of the time, contributed and the album stayed #1 on Billboard’s charts for many weeks. Now coming to the Bradley Cooper and Lady Gaga 2018 re-imagined story. Again, music brilliant and worth the price of a ticket. Otherwise I’ve been trying to find out why the movie itself left me flat. It was Bradley’s first directorial debut and he also wrote the screenplay and thought maybe that was why. The story itself has evolved where the female lead has a fuller, richer life and there is more depth of the characters. No doubt, if Judy Garland’s 1954 version was made today, she would have been stronger and more independent than her era would have allowed. By writing this blog it dawned on me why. It’s because how far we have yet to go to break away from patriarchal ego. Women will still fix what’s wrong within the family community. That’s a given. Fame and fortune, for the wrong reasons, will create the users and the takers. That’s the lessons and the earlier learned, the easier life becomes for all we encounter. With knowledge comes strength. With trust in your own good self, you can conquer anything. So, let this version of a Star is Born be a springboard of Real change. Change is where women are on equal footing and their voices are heard. Time is now.